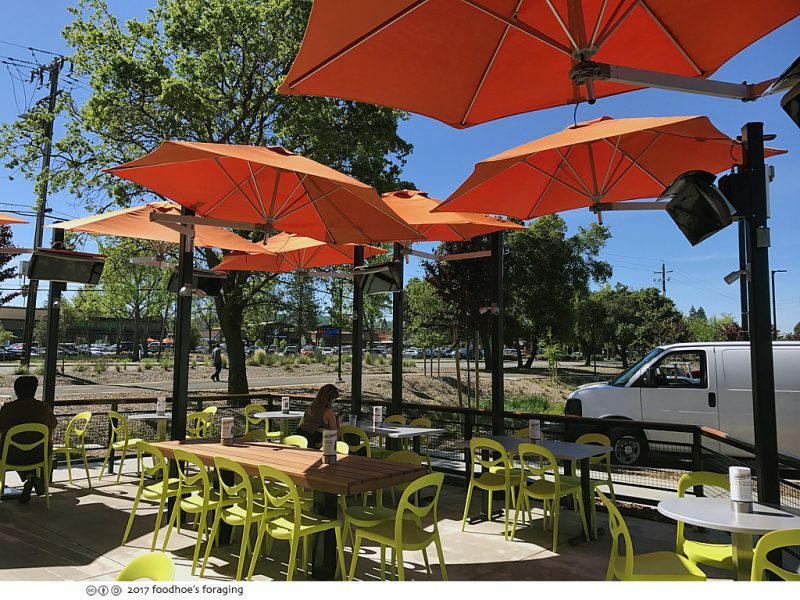 I recently discovered a new shopping area in Walnut Creek called the Orchards, which is anchored by Safeway on one side of Ygnacio Valley Road and Whole Foods on the other. There is plenty of parking and a few lunch spots that are definitely worth a visit. 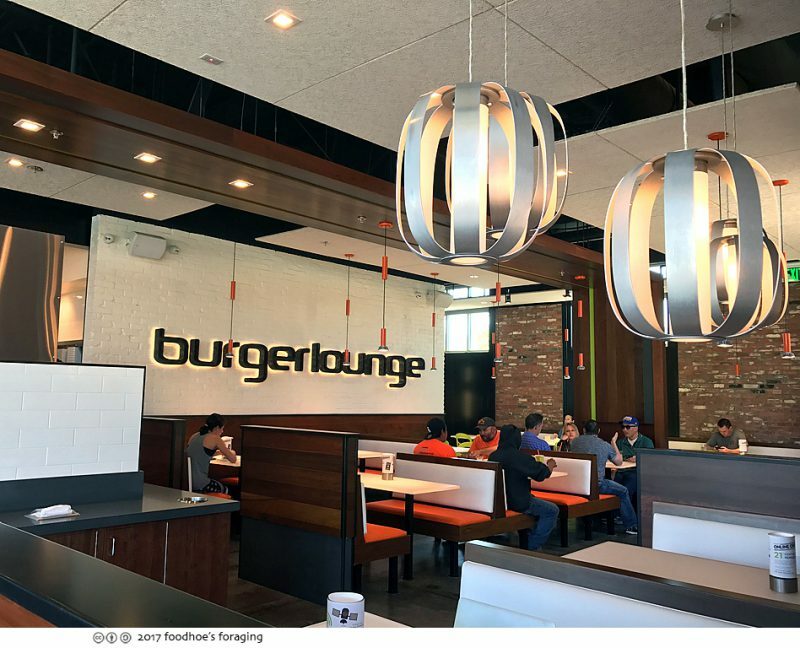 Last week I was invited to dine at the new Burger Lounge which just opened its first NorCal location that I was excited to check out. 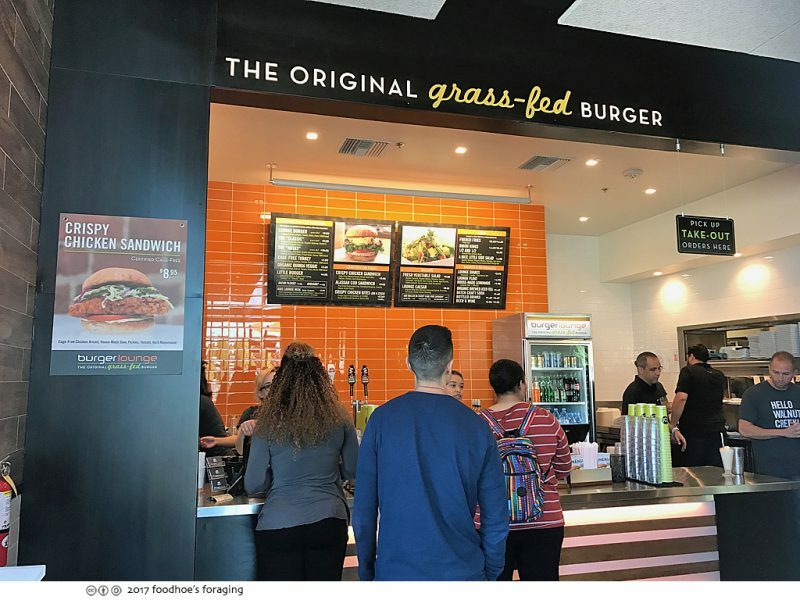 They are a chain with 20 or so locations in SoCal and what’s special about them is that they have grass-fed burgers on the menu for $7.99! 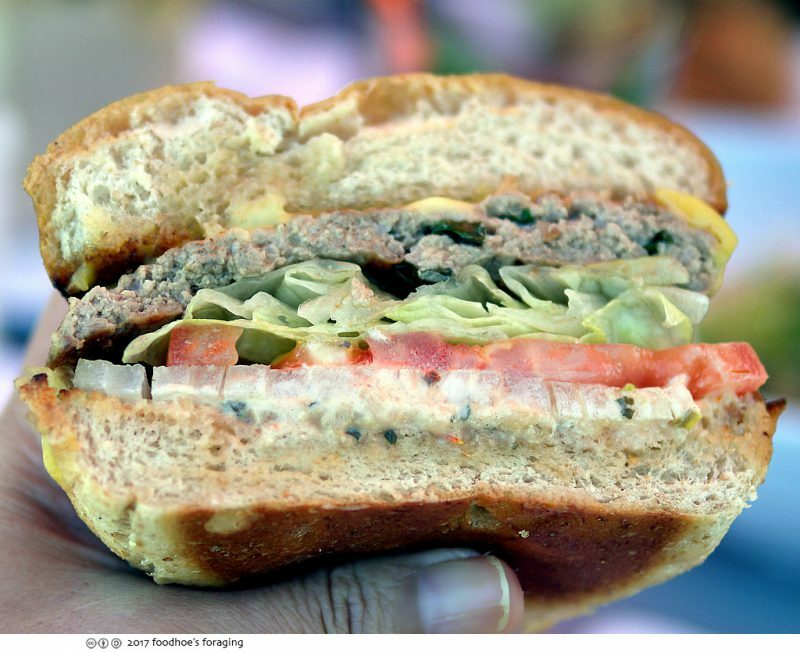 They believe that a burger should not only taste great, it should utilize healthy ingredients sourced from sustainable environments. I really support this and am so glad to have a nearby burger joint with a conscience! The interior is bright and modern, the staff greets everyone with enthusiasm and friendly smiles. It’s very much a fast food operation, where you stand in line at the register to order only it feels upscale and the seats are comfy. They give you a GPS pager when you place your order, which means that a server brings your food to your table when the lights begin to flash. 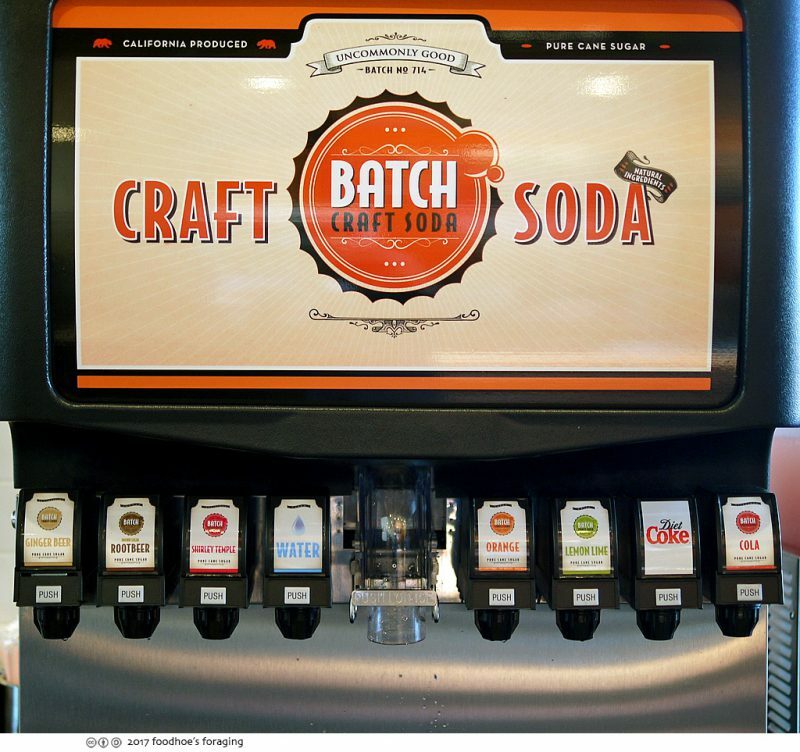 While they have craft soda made with pure cane soda like ginger beer and shirley temples, you can still get a good old diet coke. 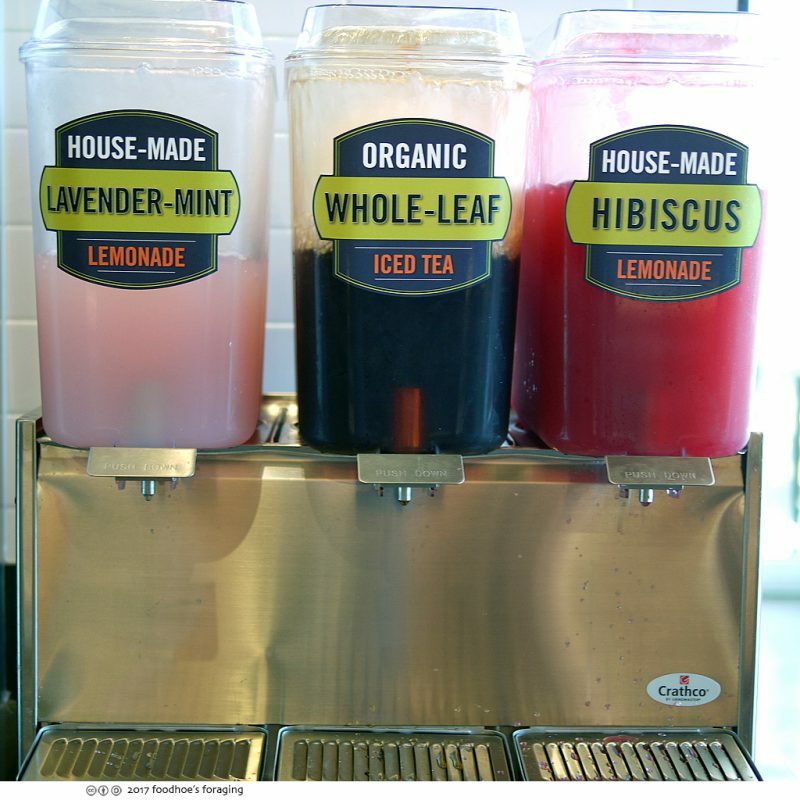 There are several house made beverages, organic brewed ice tea, and two types of house-made lemonade: hibiscus or lavender mint. I tried them all, and would take any one of the lot. 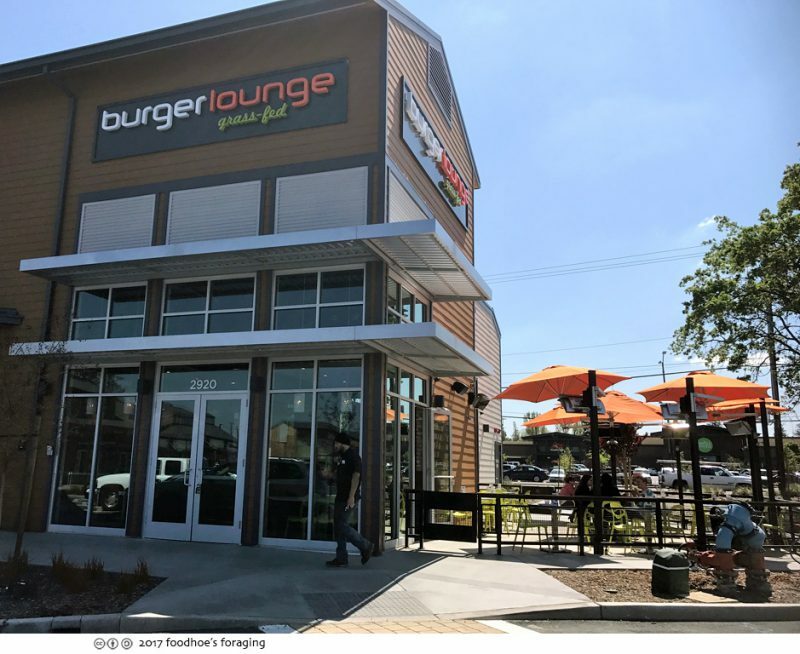 I went with my co-worker Tina and we split the Loungeburger, which is made with a hefty patty topped with choice of organic cheddar or american cheese, lettuce, tomato, onion (choice of grilled or raw) and house 1000 Island. 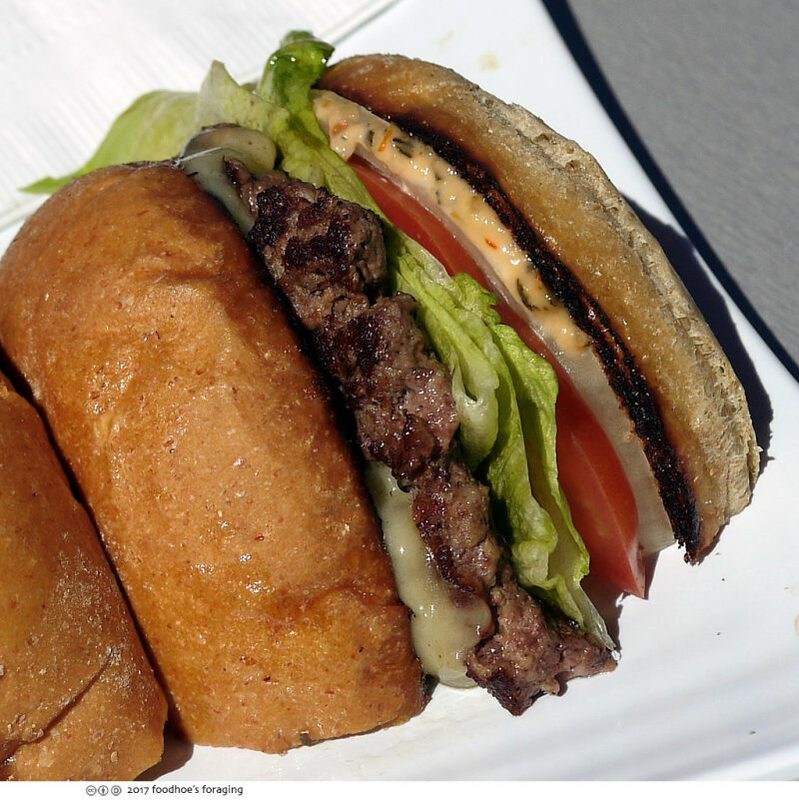 The burger is cooked medium unless requested otherwise and served on a soft bun that’s baked especially for the restaurant and made with a bit of whole wheat and blackstrap molasses, lightly griddled on the insides. You can see how the juicy the burger is if you check out the bun, which was tender and absorbed the flavorful drippings like a delicious sponge. 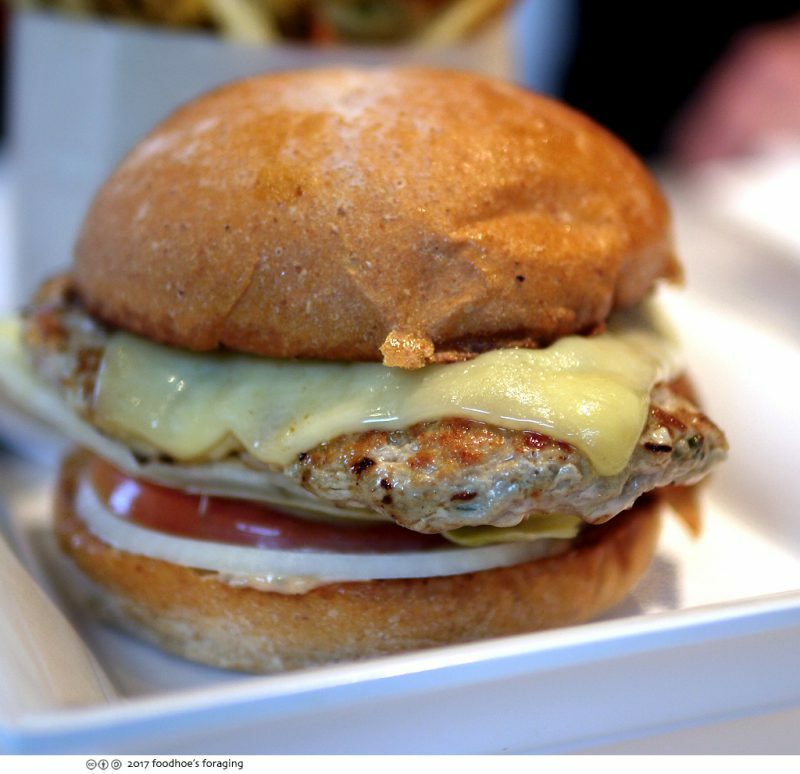 I highly recommend the Turkey Burger, because the patty is made with cage-free turkey that has been mixed with lots of chopped fresh basil which made it so flavorful and it had a very nice sear. This was actually our favorite. You can also order the Little Burger that is $1 less and perfect for those with a smaller appetite. We savored each bite, appreciating the excellent balance of flavors and textures. 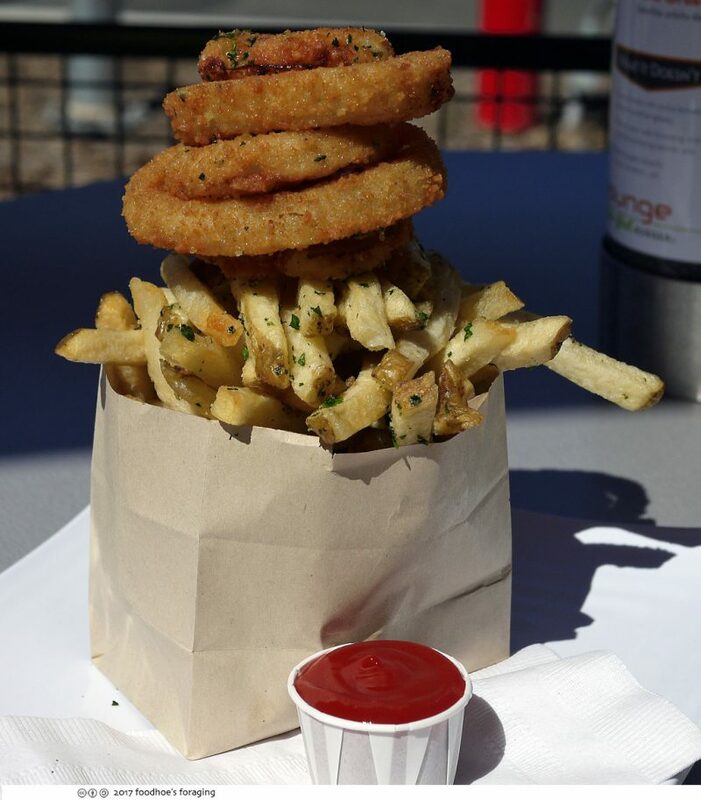 Also recommended is the combination of Onion Rings and French Fries aka the Half & half for $5.99 and is meant to be shared. The onion rings had an addictively savory crunchy crust and the onion inside was tender, it was so good dipped into the housemade ranch and ketchup. The fries are also fresh cut and not formed, with a light crispy crust and tender inside. 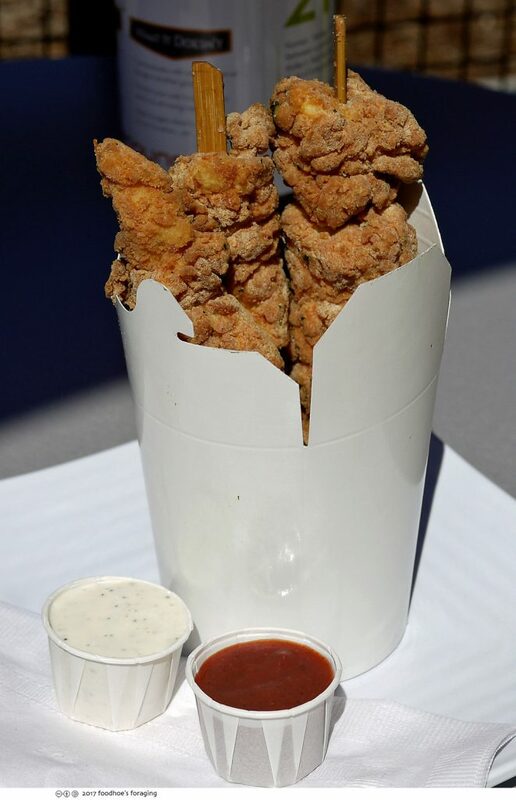 I couldn’t resist trying the Fried Chicken Bites on a stick (3 sticks/$8.50 or $2.99 each), cage free chicken breast with house buttermilk ranch and BBQ sauce. Nice big chunks of chicken, not formed nuggets, although not served fresh from the fryer. 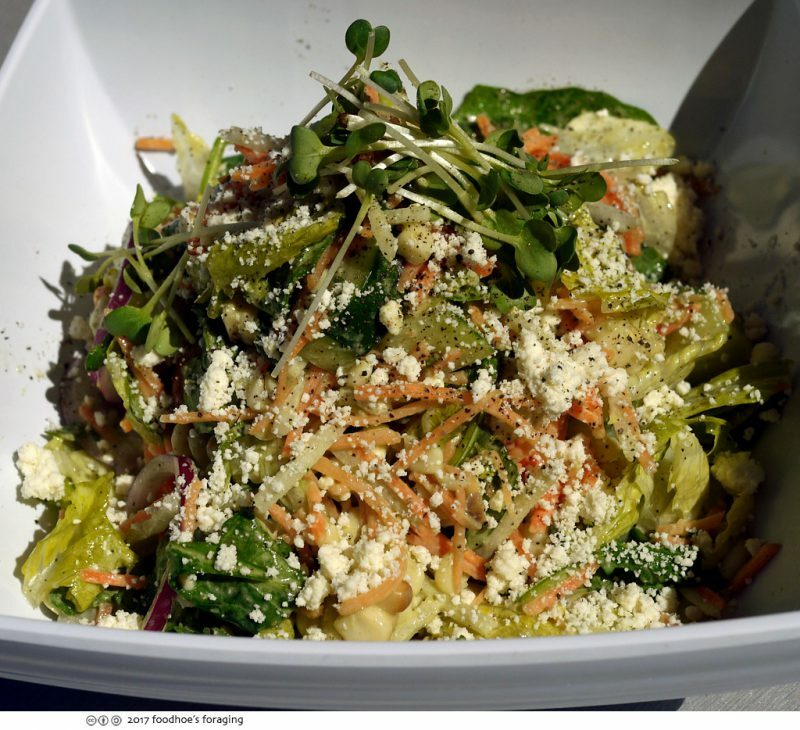 And we sampled the Fresh Vegetable Salad ($8.95) which was full of fresh organic greens, tomato, corn, carrot, cucumber, red onion, jicama, aged ricotta, daikon sprouts tossed in the house lemon-basil vinaigrette. It was light and refreshing with lots of exciting ingredients – a lovely side dish if you are so inclined to pass on the fried stuff. There’s more to explore on the menu, the Caesar salad with kale, roasted butternut squash and pine nuts, the pan fried filet o’fish, crispy fried chicken burger, shakes and floats too… Thank you for the feast Burger Lounge and welcome to the neighborhood! It was so good that I came back the next day for another turkey burger and half and half, and look forward to another visit soon. my, my, that’s a lot of good-looking food! i wish we had a burger place like that close by!